AMTEC Corporation is the largest volume producer of 40mm Grenade Ammunition and Fuzing in the world, and is the current sole Prime Contractor to the US Department of Defense for the 40mm Family of Grenade Ammunition. 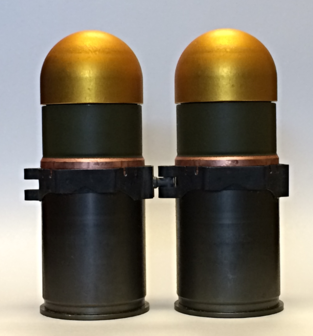 The 40mm Family of Grenade Ammunition includes both low velocity and high velocity cartridges across tactical high explosive, training, illumination, and non-lethal configurations. 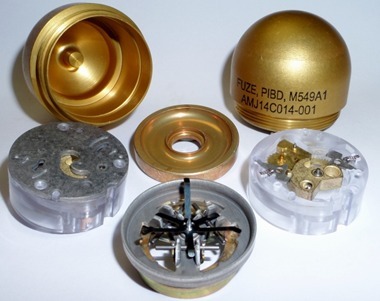 AMTEC Corporation also produces various precision fuzes, firing devices, impact switches, and initiators for the US Department of Defense, other prime contractors, and international allies. Headquartered in Janesville, Wisconsin, AMTEC Corporation provides state-of-the-art facilities and equipment, highly qualified personnel, and substantial financial resources to ensure high quality, reliable products delivered on-time. AMTEC Corporation is also a certified small business under NAICS 332993 (Ammunition Manufacturing, except small arms). As a successful prime contractor to the US Department of Defense on major programs, AMTEC Corporation demonstrates effective Systems Management (including supply chain, inventory, risk, Technical Data Package maintenance, and system engineering) to ensure delivery of safe, effective and reliable product. Our quality system is ISO 9001:2015 registered. AMTEC Corporation’s history is rooted in the manufacture of precise, tight tolerance mechanical and electro-mechanical assemblies for the defense and electronics industries. The key tenants of our success have been a complete understanding of the tolerances and processes needed to produce consistent performing products and in-house design and fabrication of all production line tooling and equipment. Today, AMTEC continues that tradition with high and medium volume assembly using state-of-the-art automation manual assembly processes, augmented with automated inspection systems, including x-ray and vision systems. The M433 is a high explosive dual purpose tactical 40mm cartridge. It contains a pre-fragmented steel projectile body and armor penetrating shaped charge liner. It can be fired from all M203 type single shot and multi-shot grenade launchers. AMTEC Corporation is the only company in the world manufacturing the M550 fuze and corresponding M433 Cartridge to the current US Military Specifications. 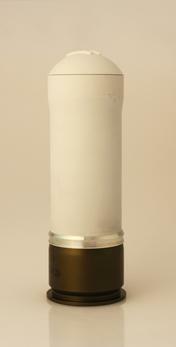 The M583A1 is a low velocity 40mm White Star Parachute Illumination Cartridge. 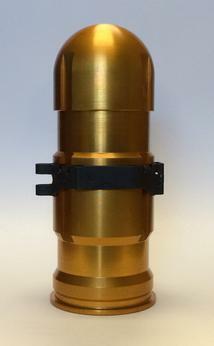 This Cartridge is used for overhead illumination or ground target marking. It can be fired from all M203 or M320 type single shot grenade launchers. AMTEC Corporation supplies to the current US Military Specifications and is the current supplier to the US Military. The M781 is a low velocity training round that is the compliment to the M433 HEDP. 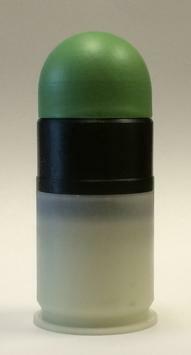 It displays an inert orange marking powder to simulate target impact. The M1006 Cartridge is a 40mm direct fire round designed as a blunt trauma pain compliance round. It is highly accurate and effective across a broad range of distances. It is capable of firing from single and multi-shot 40mm grenade launchers. The M922A1 Dummy is used for MK19 Grenade Launcher function training. The reusable linked cartridges can be cycled through the weapon simulating the loading sequence and is safe for classroom instruction. The M430A1 is a high explosive dual purpose tactical 40mm cartridge. It contains a pre-fragmented steel projectile body and armor penetrating shaped charge liner. It can be fired from all MK19 type automatic grenade launchers. AMTEC Corporation is the only company in the world manufacturing the M549A1 Fuze and corresponding M430A1 Cartridge to the current US Military Specifications and is the sole source to the US Military. The M918 is a 40mm high velocity cartridge. It is the training compliment to the M430A1. It can be fired from all MK19 type automatic grenade launchers. 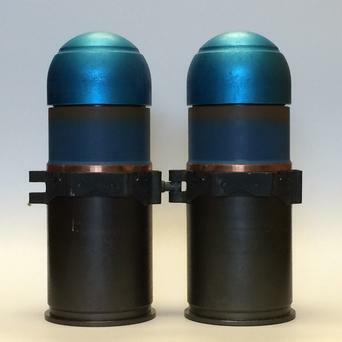 AMTEC Corporation with our projectile body partners are the only source in the world manufacturing the M550 Fuze and corresponding M918 Cartridge to the current US Military Specifications and are the sole source to the US Military.